‘Get Hep C tested’ is a campaign encouraging people who don’t know they have hepatitis C to get tested. Campaign went live 25 February 2019. Around 50,000 New Zealanders have hepatitis C (hep C). But many don’t know they have it as the symptoms are subtle, like tiredness. Hep C is serious. It can lead to liver cancer and if left untreated it can be deadly. But with new, better and easier treatments hep C can be cured. This campaign encourages people who are most at risk of getting hep C to get tested by contacting their GP. The campaign was developed in partnership with the Hepatitis Foundation and the Ministry of Health. Find out more about the campaign below and share the resources in your communities. Around 50,000 New Zealanders have hep C but many don’t know they have it. Hep C is serious, it can lead to liver cancer. You can get hep C many ways like getting tattooed. But the most common is from sharing needles – so if you’ve ever injected, you should get tested. With new, better and easier treatment hep C can be cured. Ask your GP to get tested. The primary audience for the campaign is people who have hepatitis C (hep C), but do not know they have it (estimated to be 25,000). We are particularly targeting people who injected drugs in the 80's and 90's, as sharing needles is by far the most significant risk factor. This group are typically aged 45 to 65-years-old, predominantly male, but not exclusively. 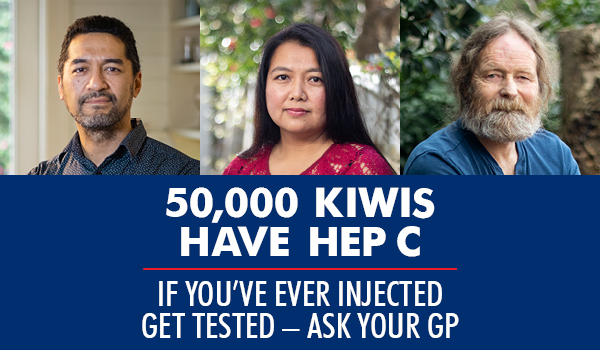 As stigmatisation can be an issue with hep C, the campaign shows that it is widespread (around 50,000 New Zealanders have it), that people from all walks of life can have hep C, and that it can be treated. While the campaign is not targeting people who currently inject, The NZ Needle Exchange programme have developed a “Know it, Treat it, Beat it” campaign within this community of people. Resources such as videos, posters and online banners are available for community organisations and others to promote the campaign in their local communities.